Our main focus at PowerProduction Software is how to make the simplest, easiest previz software so you can get your project done quickly and efficiently, with great-looking boards that will wow your clients and communicate your vision to your cast and crew. 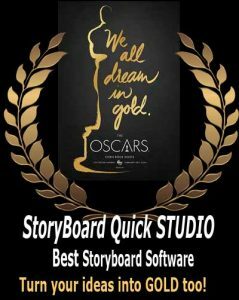 In order to fulfill that mission, we have created Video Tutorials that are available online to all owners of StoryBoard Quick and StoryBoard Artist for pre-visualization. For StoryBoard Quick, we will show you how to use your Characters and other Libraries, how to import your images or script, basic features like Key Color and the Crop Tool, as well as interface elements like the Main Toolbar. We’ve made sure to explain and show off StoryBoard Artist’s additional features as well, such as accessing the multiple Caption Windows, creating Animatics, using your Timeline and Pan & Zoom tools to polish your storyboard project. Artist tutorials are also available for basic processes like changing your Aspect Ratio, finding your Libraries, importing graphics, and inserting and using the pre-loaded artwork. These tutorials are accessible through the Help Menu in your storyboard software. Or you can visit our support page and select your storyboard product and login to view all the tutorials you want at your own leisure! If you need more assistance, come chat with us. We’re continually recording and posting new tutorials! Feel free to post a comment below if there’s a video you’d like that hasn’t been posted yet. Additionally, all our products come with a User Guide to make the previz storyboarding process as simple as possible for you! You can open the User Guide PDF by clicking “StoryBoard Quick Help” or “StoryBoard Artist Help” in your Help Menu. Upon email request, educators can also get the “K-12 Teacher Workbook” to help integrate StoryBoard Quick into the classroom.